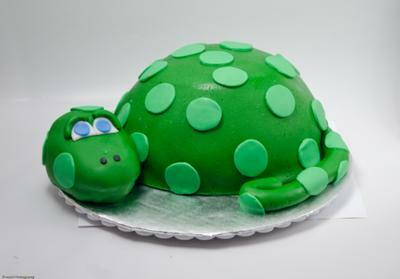 Look at this fabulous green dinosaur cake...almost too cute to eat! The spots really add to this dinosaur and what a cute face. To make the body half a soccer ball mold was used. Wilton makes these and you can find them on Amazon. The head and tail are shaped from rice krispies treats. Fondant covers the entire cake. 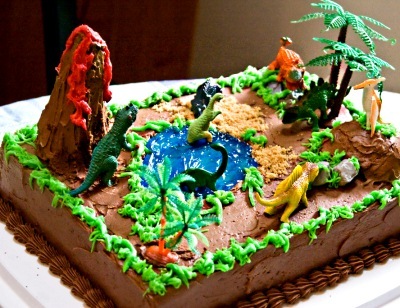 Here is a neat dinosaur cake idea for a birthday party cake. A creative scene filled with dinosaurs, trees and even a small pond and volcano. Bake a 9 x 12 cake of your choice and cover with chocolate frosting as your base layer. Add green icing on the edges with a tip to create the plants. Build up mounds to create interesting features for your dinosaurs to stand on. Blue gel icing is used to create the water for the pond with some brown sugar for the "sand." A sugar cone was used to make the volcano with chocolate icing and the lava is red buttercream icing. Plastic dinosaurs and tree figurines are placed to finish the scene. Special thanks to Roland for allowing us to use his dinosaur cake idea! 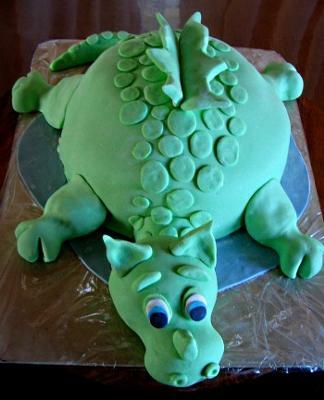 A fantastic dinosaur shaped cake will light up any child's eyes. This green dinosaur was a lot of fun to make. A half ball tin from Dolly Varden was used to create the body of the dinosaur. The cake was covered in buttercream and then fondant. All of the details including the spots, face, legs are all made from rolled fondant.